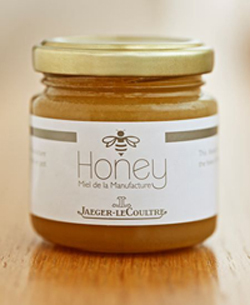 Strange to read the name of Jaeger-LeCoultre on a Product that is not a luxury watch, but from July it will taste the sweetness of the honey house, thanks to the Manufacture Jaeger-LeCoultre. The fashion house has Decided to produce His own honey , a unique product and not Just Because designers. La Grand Maison, as is known, has in fact installed in front of his home, Surrounded by nature in the Vallee de Joux, ten Beehives from Which he started Producing His honey. From A Part decision of the house for the environment and that will delight gourmands. For lovers of the sweetness of honey is not the first case of a product designer. Louis Vuitton Also Launched His honey “Belle Jardiniere” , produced from hives on the roof of one of the boutiques of Paris. Honey is produced in collaboration with Nicolas Geant, expert beekeeper, ‘which together with the house, she wanted to Demonstrate the importance of bees as a thermometer of the environment in cities. Jaeger-LeCoultre now also has ITS honey production designer. In the forests of the Vallee de Joux, the House has ten hives thus placed and Also present was during the production of honey. The famous swiss brand was entrusted to a professional beekeeper in the region, Franck t Croze, who Took care of bees and gave his cooperation for the production of honey, while the protecting the environment and biodiversity. The production was created in order to Emphasize that visitors to come here from all over the world as the more than 1200 employees of the house, the minor importance of environmental conservation, a subject very dear to Jaeger-LeCoultre, often involved in Such initiatives. The bees are in fact at risk is essential for pollination, are threatened by pollution and every occasion for their conservation is a step forward in the fight for the environment. Therefore the brand has wanted to link His name to a very important aspect for businesses, one of ecology: is not the only aspect in which the mark is Concerned, ITS given strong relationship with the art world, and I know that especially the seventh art, but it remains a choice that will please, in every sense, to many. From July I know you can buy the “Honey Factory” Jaeger-LeCoultre, as stated in the label, clean and simple style which stands out of the house logo: a touch of sweetness that is good for nature, but with style.